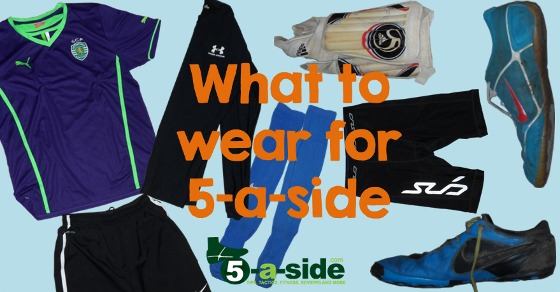 What should you be wearing for 5-a-side? To most people it’s fairly obvious, but it’s still something that I see people searching for on the internet. 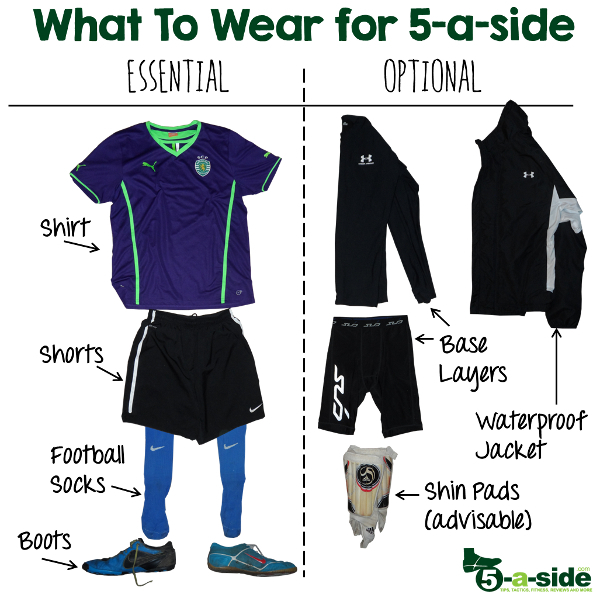 This article is going to cover all the essentials that you need to wear for a game of 5-a-side or futsal, plus some extras that you might want to consider if you haven’t already. I’ll show you exactly what I currently wear and why. When it comes to shirts, the choices are covered in detail in this guide to buying cheap football kit. Essentially, you can wear almost any kind of T-shirt that you want. However, it’s generally a good idea to try to pick out a football shirt if you have one. They’re lightweight, let your body breathe and handle sweat a bit better than heavier cotton shirts. I use my Sporting Club de Portugal shirt (you probably know it as ‘Sporting Lisbon’) for a kickabout. Avoid: anything that is skin-tight or sleeveless. You need a pair of proper sports shorts. Any old pair won’t do. They need to be lightweight, elasticated and with a draw-string that holds them up. I use a pair of Nike football shorts, there’s no need for anything fancy. Avoid: shorts that are either too short or too long. Also avoid jogging bottoms or ‘sweatpants’ unless you’re playing in goal or want to look like a chav. Make sure you get some football socks. They’re long enough to pull up over shin pads if you choose to wear them (for some competitions it’s compulsory) and thick enough to be comfortable and warm. Avoid: thin socks or short-cut trainer socks. If it’s artificial turf then you want special artificial turf trainers, with dimpled sole to help you grip – read our guide to the best boots for artifical turf for a more comprehensive look. 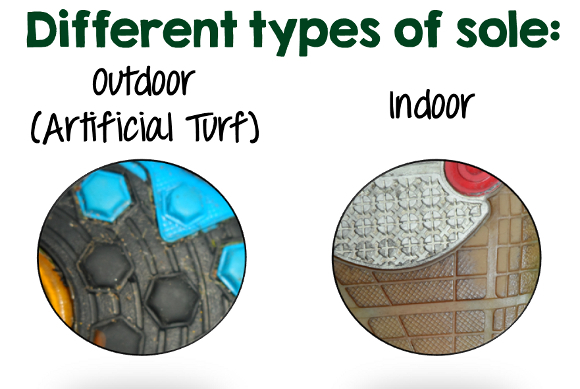 If it’s indoors, you can still wear your AstroTurf trainers, but you might want to consider getting some specific indoor ones, generally with a gum-rubber sole. Either way, the key is to make sure that they’re non-marking soles. Most trainers will be, but if not you could be in a spot of trouble. Avoid: boots with studs, especially blades. There’s no need to wear these unless you’re playing on grass. In some 5-a-side leagues wearing shin pads is a requirement. If you’re playing on artificial turf you’re best off always wearing them to prevent injury (especially if there are reckless stud-wearing maniacs around, which there nearly always are). It’s one of 5 good ways to prevent silly injuries. If you’re concerned that wearing them will mark you out as either (a) a pansy or (b) someone dressed for war then slip them in your sports bag. Some sessions you’ll be glad to have them. You can see mine are a bit tatty now, but I really like them as they’re very lightweight and they also have the ankle-guards, which have spared me from a couple of nasty injuries over the years. Recently, though I’ve been trying out the S1 Sport shinpads – worth a go if you hate wearing normal shin pads and are looking for something different. See the S1 Shin Pad review here. Warmth. For an item that is so thin and lightweight, these can provide an incredible amount of warmth. Not only are they a lot lighter than wearing a jumper (‘sweater’), they stay close to the skin and don’t let the drafts through. Compression. The theory goes that by providing compression to your muscles they will work more efficiently. Personally, I have felt a difference by wearing compression shorts. I am not sure if I am more efficient, but I have certainly had less groin and hamstring injuries, so I’m converted. Note that not all base layers do the same thing. If you want warmth, go for something like underarmour cold gear* – I’ve been using that for the past two years and have been very happy with it. If you want compression, make sure it advertises that as a feature. Something like Skins branded base layers* will have this feature. Avoid: wearing base layers without a layer over the top – not a good look. Also avoid wearing anything that is designed for the cold when it’s hot outside; you will cook! If you’re playing anywhere where it might rain (oh how I love this British climate) it’s worth having something to keep the rain off. For me, my waterproof jacket is an essential item of kit. It’s light enough not to really notice it’s there and is a blessing when the skies open. It provides a little bit of warmth, but that’s not the main job: I rely on base layers for that instead. Avoid: things that might look to be made of waterproof material but aren’t waterproof at all. A complete waste of money. Cheap football kit – a guide – If you’re thinking about buying yourself a new shirt for football, don’t do it until you’ve read this guide. 30+ Fashion crimes you see at 5-a-side – A humorous look at some kit disasters you see committed at 5-a-side. How many have you committed?